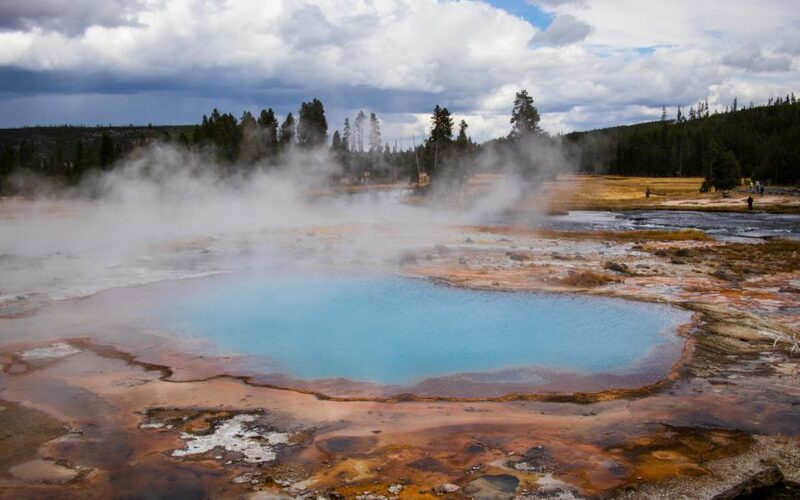 Yellowstone National Park is one of the most famous outdoor areas in the world – known for its stunning scenery, impressive animal life, and (most of all) its widespread thermal activity. Yellowstone, after all, is located in the caldera of one of the world’s largest super-volcanoes. It’s no surprise then that the planet’s most well known geyser (Old Faithful) calls Yellowstone National Park its home. 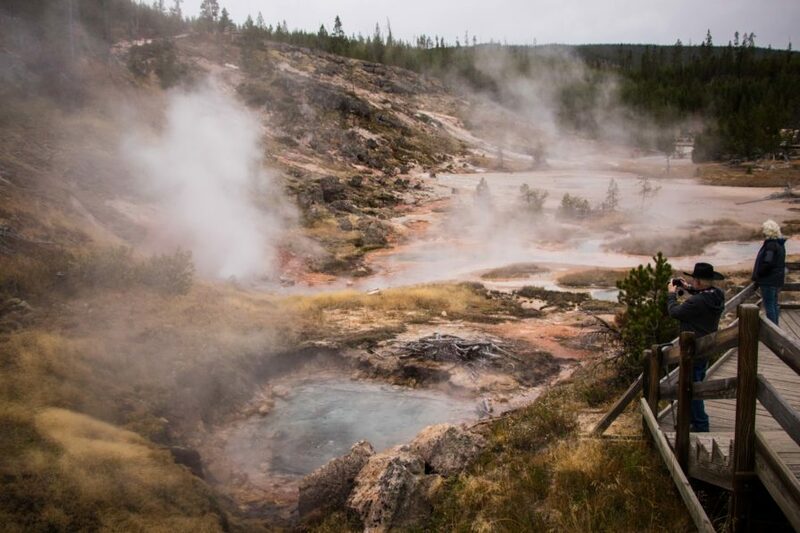 While Old Faithful may be the attraction most visitors to Yellowstone National Park come to see, there is a whole lot more to this protected parkland than just a single regularly erupting pocket of hot water. Yellowstone National Park, while not necessarily known as a cycling destination of any kind, is actually a fantastic place to conduct a short 3-7 day cycling adventure… as you will see if you simply watch the video below. In this article we’ll be discussing what it’s like to cycle around the southern loop of Yellowstone National Park – parking your car near the Grant Village Visitor Center on the western edge of Yellowstone Lake and then cycling in a circle for approximately 3 days (95 mi / 152 km) while stopping along the way to explore some of Yellowstone’s most iconic geysers, thermal pools, waterfalls, rivers and other points of interest. While it is possible to cycle into Yellowstone National Park on your bicycle, most people who visit the Park come in a motor vehicle. If you’re coming to Yellowstone in a motor vehicle with the goal of cycling around the Park for several days, then you’ll need to find a place to safely park your car for the days you are away on your bike… and the best place to do that is at the Grant Village Visitor Center on the western edge of Yellowstone Lake. Just outside the Grant Village Visitor Center is the backcountry office. Go into that office and tell them you are planning to cycle around the Park for a few days and that you need a safe place to park your car for the days you’ll be away on your bike. The people in the backcountry office will ask about your intended route and then, they should, give you a permit to place in the window of your vehicle. This permit is basically a piece of paper that says which day you plan to return to your vehicle… and states that you are away on a multi-day bike trip. Once you’ve received that permit for your vehicle, ask the people in the backcountry office where you should park your car, truck or van. The location of these parking spots may change depending on the time of year you visit the Park and which person you ask. When I visited Yellowstone National Park in late September, I was asked to park my van in the parking lot across from the US Post Office right outside the Grant Village Visitor Center. Place the permit for your vehicle in the front window of your car, truck or van and then load up your bicycle. Your bike tour through Yellowstone National Park begins right now! Wild camping or free camping (whatever you want to call it) is not allowed in Yellowstone National Park. You can’t just camp wherever you want (unfortunately). If you are planning to cycle across the Park, you need to camp in either one of the large, designated group campgrounds or in one of the few backcountry campgrounds scattered throughout the Park. During my 3-day bike tour in Yellowstone National Park, I spent two nights camping in the larger established campgrounds and a single night camped out in one of the backcountry campsites along my route. If, however, you plan to spend the night at one of the backcountry campsites, some advanced planning is required. 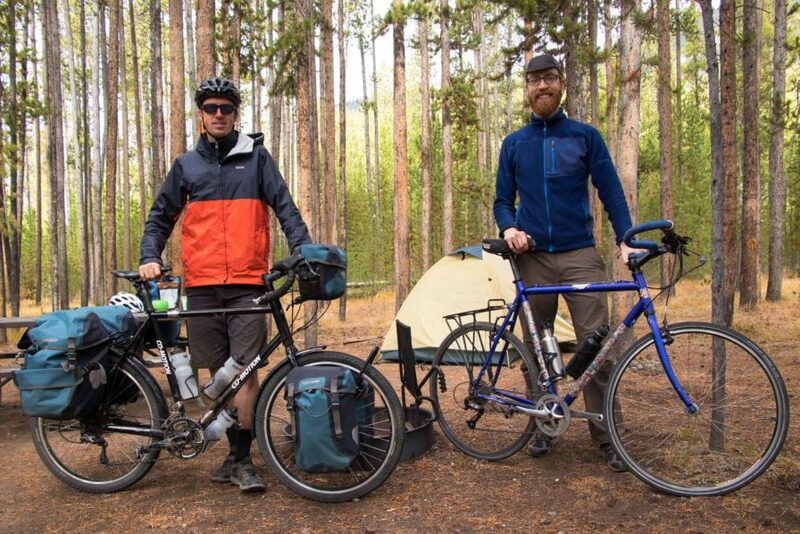 First of all, not all backcountry campsites are accessible by bicycle. In fact, most of the backcountry campsites are only accessible on foot and most trails in Yellowstone do not allow bicycles of any kind. 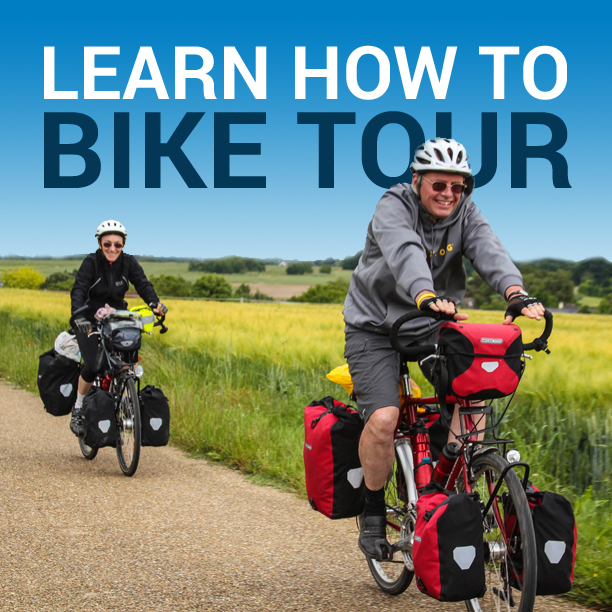 So, do your research in advance and know before you go, which campgrounds you’ll be able to access with your bicycle. Once you do decide on the backcountry campsites you want to stay at, you’ll need to get a permit before you can camp. To get this permit, simply pay a visit to the backcountry office in the Grant Village Visitor Center before you take off on your tour. Tell them where you want to camp and which night(s) you plan to stay there. If no other campers have already claimed that campsite, you’ll be issued a permit for a single night of camping in that location. As you can see, backcountry camping is risky and does require both some planning and good luck, as these campsites can fill up fast in the prime tourist season (summer)… and you might discover, only upon reaching the Park, that the backcountry campground you wanted to stay at is already booked and you can no longer camp there. Each and every one of these attractions has been marked on my cycling map of the southern loop of Yellowstone National Park. Click here to download the map. Before going to Yellowstone, I had been told that the roads in the Park were really bad, narrow and dangerous. Other tourists in the Park echoed these sentiments… and the Park Rangers themselves warned me to be careful when cycling around the Park on my own, as the roads were narrow and the drivers would be distracted. Despite all the negative things I had been told about cycling in Yellowstone National Park, I decided to give the Park a try… and to be completely honest, I don’t know what everyone was talking about! I found the roads in Yellowstone to be on par with any of the roads one might cycle in the United States. Yes, there were a lot of cars (usually passing in big groups with 20-30 vehicles driving past all at once, and then a short time afterward with no vehicles passing at all). And yes, the shoulders were kind of narrow in some sections, but if you are accustomed to cycling in the road anywhere else in the world (or anywhere else in North America), you’ll find the roads in Yellowstone National Park to be about the same as what you would expect just about anywhere else. Traffic is drastically higher in the summer months, so keep that in mind. Non-peak seasons are the best time to visit Yellowstone National Park if you are planning to go there with a cycling trip in mind. Be sure to pay attention to the vehicles around you. Drivers are limited to going no more than 45 miles per hour when they are within the Park (which is a good thing), but those same drivers are often times distracted by the animals and natural features around them, and they may not be looking for a cyclist on the side of the roadway. Make yourself visible, use a mirror if you think it will make you feel more comfortable, and stay alert for distracted or reckless drivers whenever you are cycling on the roads within Yellowstone National Park. 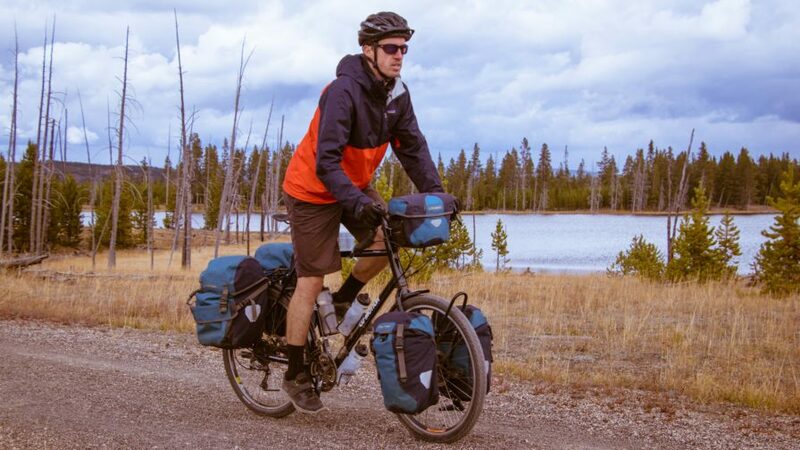 First of all, theft is not a big concern when you are cycling in Yellowstone National Park, but it’s a good idea to bring a good bike lock with you when touring Yellowstone by bicycle. Not only will you need to use your bike lock when staying in the large established campgrounds, but you will also want to use your bike lock any time you step away from your bicycle to explore the numerous geyser basins, waterfalls and other tourist attractions within the park. When you do leave your bicycle, be sure to remove any valuable items from your bicycle and carry those items with you as you walk around the Park. Secondly, there are large, dangerous animals in Yellowstone National Park and these animals are a serious threat to individuals traveling on a bicycle. Do not approach bison or bear within the Park and be sure to practice safe food handling techniques when camping in the established campgrounds and in backcountry campsites. While the larger campgrounds will have metal bear boxes provided for you in which you can store your food and toiletries, hanging your food is a recommend practice when spending the night in any of the backcountry campsites. Finally, be sure to practice safe cycling while in the Park… and be a good representative of the cycling community for bikers who may come after you. Cycle only on the roads and trails where bicycles are allowed; wear a helmet; ride safely in the shoulders and take the lane only when necessary; smile; be friendly; act smart; pick up your trash; properly dispose of your waste when backcountry camping; share your campsite with other cyclists when need be; and be a good representative of the cycling community. Got Questions? If you have any questions about cycling the southern loop of Yellowstone National Park… or you need help planning your own Yellowstone cycling adventure, leave a comment at the bottom of this page and I (or someone else in the Bicycle Touring Pro community) will respond to you within a matter of hours/days. Click here to download the map (KML file). This entry was posted in Bicycle Touring Pro Articles, Featured Articles, Main Articles, Main Featured Articles, Uncategorized, United States, Wyoming and tagged bike routes in yellowstone, cycling in yellowstone, geyser, geyser basin, national park, old faithful, southern loop of yellowstone, yellowstone, yellowstone bike tour, yellowstone national park, yellowstone national park bike tour.